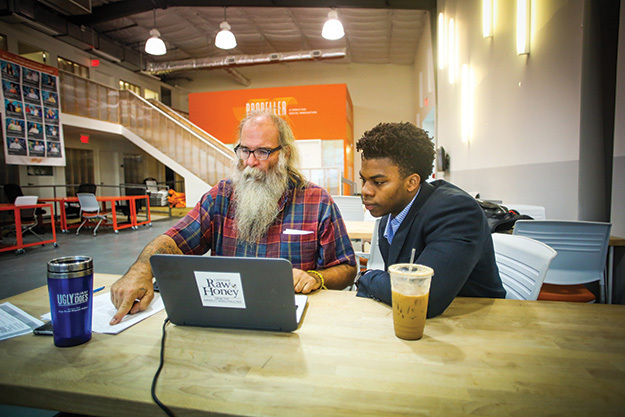 Capstone Raw Honey founder David Young, left, worked with Freeman student Carlos Wilson, right, to upgrade his accounting system as part of an innovative service learning project. Capstone New Orleans began as a nonprofit that grows food on vacant lots in the Lower 9th Ward and distributes it to people in need at little or no cost, but founder David Young soon got the sweet idea to begin selling honey (he’s also a beekeeper) as a way to support the food giveaways. Capstone Raw Honey was a hit with consumers, thrusting Young into the new role of culinary entrepreneur, but as the company began to expand its retail sales, he found himself in serious need of an accounting upgrade. To help organize his books, Young turned to an innovative service learning course created through a collaboration of the A. B. Freeman School of Business and Propeller, a nonprofit that works with New Orleans-based social ventures. their ventures understand the principles of accounting and the impact of various financial decisions. Carlos Wilson (BSM/MACCT ’16), who led the team that helped Young convert his bookkeeping system to QuickBooks, says the experience was a valuable bookend to his busy season internship. The project was especially meaningful for non-U.S. students, who make up a large majority of the one-year MACCT program. While international students are limited in terms of work and internships due to visa restrictions, the Propeller project gave them a chance to gain practical experience that otherwise wouldn’t have been possible. “It was attractive to me because it was experiential,” says Lucy Ren, a MACCT student from China. “In school, we learn the skills and know how to apply them on exams, but we don’t know how they would actually work in real life. 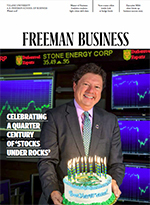 I wanted to work with a venture and apply the knowledge I was learning in school.” While it’s uncertain if the course will continue in its current format, Freeman School Dean Ira Solomon says it embodies the kind of community-oriented programs the business school is pursuing through the Lepage Center for Entrepreneurship and Innovation.